1 bed Cottage in Cliburn - 272427 - Railway Signal Box Holiday Cottage, Penrith Cumbria. (Cliburn Station). Need more information about booking Home 272427 ? Visitors to Cliburn Signal Box will find that, whilst it has been completely modernised, it has been tastefully renovated to retain its charm and many of the original features and characteristics. Its secluded location is ideal for those wishing to relax and get away from it all, those wanting to be closer to nature, or those wanting to get out and about. 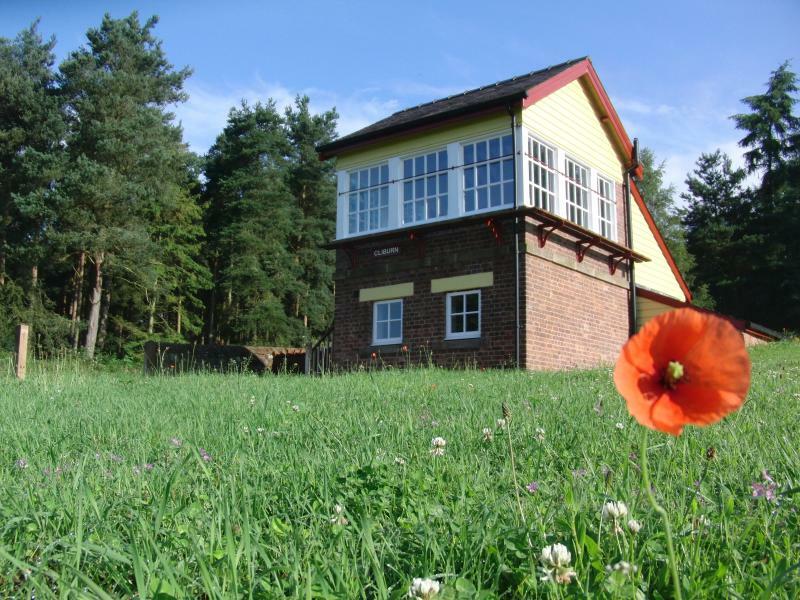 Nature is on your doorstep, with visitors often seeing the local red squirrels and the Signal Box uses the first floor lounge, which has windows to three sides, to give breathtaking views of the Eden Valley. At night little light pollution means that it is perfect for stargazing and if that wasn't enough, a short drive and we are walking up one of the many fells or playing in one of the lakes. We are 7 miles from the nearest town, so a car is recommended. However, once here the local roads are ideal for cycling, if that's one of your hobbies. We are nearby to help with any problems or queries if needed and can help with recommendations for restaurants etc if required. After that we leave you to your own devices and do not bother you unless you want us to. This Cottage has 1 bedroom, 1 bathroom and sleeps 4. It’s been listed on Holiday Lettings since 05 Nov 2012. Located in Penrith, it has 40 reviews with an overall rating of 5. The average weekly rate varies from £413 to £626. My 6-year-old Son and I recently spent 3 nights at the Signal Box at Cliburn. From the moment we arrived, we knew we had made the right choice for our mini-break. The Signal box has been lovingly converted into a unique and cosy retreat nestled in a beautiful and peaceful location in the Eden Valley. The signal box is spotlessly clean, spacious and is fully equipped with all the utensils and appliances you may need, it also boasts a wonderfully comfortable bed from which my son needed to be prised every morning. The underfloor heating kept everything cosy and our only regret is in not having a night cool enough to try out the wood burning stove in the lounge. The signal box is in the perfect location from which to explore the Lake District, North Pennines and Eden valley and during our stay, we managed to explore High Cup, rode the Ullswater Steamers, visited Aira falls and even bagged our first three Wainwrights! Gavin and Wendy were away during the time of our stay, but Gavin made sure we had all the information we needed for our arrival and replied promptly to any questions we posed and made us feel welcome from the start. Our stay at the Signal box proved a memorable end to the summer holidays and we hope to be back for a longer stay next year. Look no further if you are looking for the perfect place to stay in this beautiful part of England. I've just returned from a weekend break in the signal box and it was a fantastic experience to stay in this quirky conversion. It's very well laid out and the underfloor heating ensures a nice cosy atmosphere. The signal box is an ideal base to visit Cumbria, The Lake District and the Pennines. Gavin and Wendy are really nice and helpful, without being intrusive and even dropped off a phone charger for me when I mentioned I'd left mine at home. I will be highly recommending this property to my family and friends. We booked a four night stay at the Signal Box, as we needed to work nearby and we used to live in the village. We used to walk past the Signal Box regularly and were so pleased to find out that the Old Signal Box had been renovated. And to such an excellent standard too! We really enjoyed our stay and did not want to leave! It is a great place to chill out and we certainly managed to relax and enjoy some walks too. We loved been met by and looking at the wildlife (hens/ducks) and glad that there was no cockerel to wake us! The views are stunning from all angles of the living room and we were lucky to have snow on the mountains in the distance. We were only disappointed that we did not get snowed in like the previous guests and we therefore had to leave! We can't wait to return! We needed accomodation for a last minute weekend to Penrith and luckily this very popular signal box came up in a google search. We loved the way it looked from the website and were not disappointed. The quirky accomodation has been renovated to a very high standard and made the perfect base for my husband, baby and I. The location is so convenient and the views from the sitting room were spectacular (as well as enjoying watching the comings and goings of the local chickens!). The hosts were welcoming, available and dealt with any queries efficiently and immediately - we couldn't have asked for more. We will definitely be staying here again! My husband and I were truly delighted to experience such a wonderful few days away due to the outstanding high quality of the signal box facilities, its peaceful surroundings and customer service from the owners. The location is quiet, surrounded by woods and yet enables easy access to explore the countryside and villages of Cumbria and the Lake district. The exquisite signal box made a welcome retreat from busy lives and the fire, views and nearby chickens and ducks was wonderful! Visiting in February the log fire made it cosy and warm. I cannot rate this place highly enough. Gavin and Wendy are helpful and ensure you have all you need for a perfect stay. This property meets all expectations and more. Excellent hospitality and welcome from the owner. The signal house has been perfectly refurbished, slightly more modern whilst keeping its unique originality true to character! Very clean and larger than it looks in photos, family of 4 would still be comfortable in this property! Placed in an ideal location surrounded by woodland behind and open fields from the front, only a few cars drove past in our 3 day stay with sound of birds, lambs and lots of friendly hens and ducks making the only noise. Highly recommend to everyone!! Cliburn signal box is a beautifully restored property in a fantastic area. The property has been restored to a very high standard and includes everything you require for the overall experience. Very quirky and very clean and comfortable. It was a pleasure staying, the views from the signal box were stunning and even the neighbouring chickens and ducks were very welcoming. There is a lovely calm and relaxing feel to the property and a continuous warmth from the under floor heating. Even though we had cold temperatures and snow we were very warm and cosy. We loved it so much we are returning in july and any other opportunity we get. 10 out of 10 from us! We stayed here for three nights just after New Year, and had a wonderful break. I kept the nature of the property a surprise for my wife, who couldn't believe it when we rolled up and discovered we were staying in a restored signal box. The owners have done an astounding job of doing it up. It's beautifully decorated and furnished, with amazing original features and attention to detail. There are lovely pubs a short drive away, and it's just half an hour from Ullswater, but even if you don't want to drive, the surrounding countryside is gorgeous, and the property itself is a wonderful place to relax. We had a fantastic weekend break here with the kids. Location is within very easy reach of the Northern Lakes. The property itself is fantastic, has every facility needed and was a lovely place to stay. You can get in touch with Gavin and Wendy (the owner) through the contact form on this page. Send Gavin and Wendy (the owner) an email through the contact form on this page. Alternatively, if there’s a phone number on this page, you can call them. How do I contact Gavin and Wendy (the owner)? If you’ve already booked, go to Manage your holiday booking to view Gavin and Wendy the owner's contact details or send them a message. Or send Gavin and Wendy (the owner) an enquiry through the Contact the owner/manager form if you’d like a quote or more info first. When you pay online through the Book your stay form, a booking request is sent to Gavin and Wendy (the owner). You’ll find out within 24 hours whether they’ve accepted - no money will leave your account before then. You can also request a quote from Gavin and Wendy (the owner) through the contact form. The owner will email you the total cost for your dates and a link to book and pay online. Use the Book your stay form to pay provisionally online. You can pay by credit/debit card or PayPal. Gavin and Wendy (the owner) will have 24 hours to accept the booking and no money will leave your account before then. Why can't I call Gavin and Wendy (the owner) before booking? You’ll need to contact Gavin and Wendy (the owner) to do this. Send them a message in Manage your holiday booking or through the contact form on this page. You can request to change the dates or number of people on your booking via the Manage your holiday booking page. To change your holiday dates use the Edit booking button. If you need to change the number of guests staying then send Gavin and Wendy (the owner) a message. If Gavin and Wendy (the owner) agrees, they’ll send you a revised quote outlining the changes. You can review and accept/decline this from the Manage your holiday booking page. You’ll have 48 hours to take action before the revised quote expires. Railway Signal Box Holiday Cottage, Penrith Cumbria. (Cliburn Station).